The Trend Sports Heater Slider Synthetic Leather Lite Balls Pitching Machine Baseballs have been specifically designed with lower profile seams for greater accuracy and longer life. Perfect for all the Trend Sports machines, particularly the Heater BaseHit Pitching Machine, Slider Lite-Ball Machine & The Starter Pitching Machine. 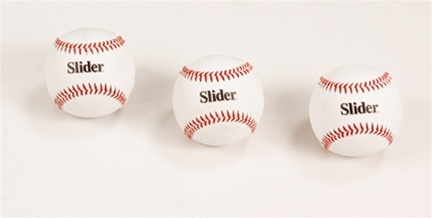 Slider Synthetic leather balls look exactly like regulation balls and provide real ball performance. The Slider Lite pitching machine baseballs are the ideal add-on for your Trend Sports Slider Lite Pitching Machine (Closer,Slider or BaseHit). The Slider Lite pitching machine baseballs have been specifically designed for your Trend Sports Slider Lite Pitching Machine with lower profile seams for greater accuracy and longer life. Synthetic leather cover design makes Slider balls look exactly like regulation baseballs and provides real game conditions. I was really surprised at the speed and realism of these pm balls. Very realistic compared to other type balls. the only drawback is that they are very light and hard to catch when using machine to throw fly balls. Great buy.